/Slatwall/Slatwall Panels/MDF & EQ Slatwall Panels - 3" O.C./Slatwall Panels - Paint Grade 3" O.C. Palay Display stocks one of the strongest paint grade slatwall products produced in the industry today. You can feel confident that our paint grade slatwall board will stand up to years of use minimizing chipping and breaking experienced by other manufacturer's slatwall. This slatwall is ready to paint. Just install and add the color of your choosing! 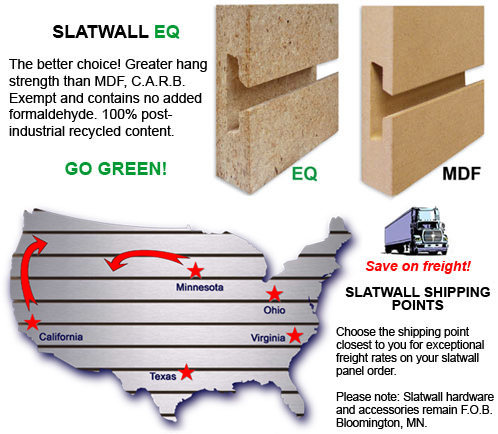 Also choose from traditional MDF slatwall board or our stronger, greener EQ slatwall board.